Today's Drawing a Day: Please? See all the January 2011 A Drawing a Day drawings! I am making a drawing every day in January, and posting each day’s drawing here on my blog. Each drawing will be placed for auction here with a buy now option for folks who don’t get into the auction frenzy. 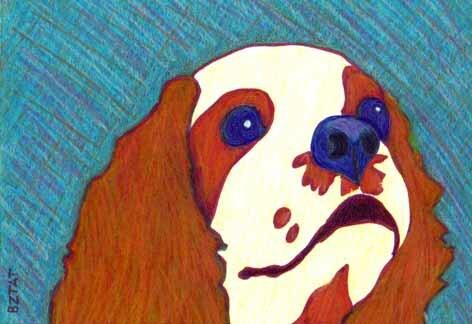 Today’s drawing is of an American Cocker Spaniel waiting ever so patiently for a treat. She is such a good dog, don’t you think? BUY NOW OPTION: You can buy this piece now for $60 as long as no bids have been made in the comments below. Simply write BUY NOW in the comments and send a payment of $60 + shipping via PayPal to bztat at bztat.com. Highest bid at 10:00 pm EST on Tuesday 2/1/11 wins the piece. Please allow 2-3 weeks for USA shipping.